The holidays are almost here and the cooking has begun! Time for family, reflection and looking towards the year ahead. One of the rich and unique traditions of our Sephardic families is a Rosh Hashana Seder. It is a short service we conduct around our tables with the Rosh Hashana evening meal, with some families doing it on both nights. Including the traditional blessings done at the holiday meal table (Kiddush, Blessing of the Children, Washing of the Hands, HaMotzi), blessings are also said over symbolic foods, expressing our hopes and wishes for the year ahead. Most of the foods used are those whose names in Hebrew sound similar to one of the wishes expressed, so there is some fun associated with this! Although primarily a Sephardic tradition, many others have begun adding the Seder to their Rosh Hashana celebrations. My father remembers the “ratzones” from his childhood in Seattle…we began sharing the tradition with our children and friends within the past decade. Rabbi Yitz Greenberg suggests that each family add some blessings of our own, adding to our family traditions, adding puns we create around foods we include, which we have done from time to time. One of our Rebbetzins, Penina Schochet, suggested that we select a new fruit each year, having our young children be part of the process, and say a “shehecheyanu” over the addition of the new fruit, as a way to further grace our Rosh Hashanah table and include our children in selecting and trying something new. Some families refer to this “service” as the “Yehi Ratzones”, referring to the words used “May it be Your will …” as referencing the symbolism that is to be recited. Often one hears the words “simanim”, referring to the ‘symbolic’ foods used. I will note some of the foods we eat and the translation of the blessings we say, primarily based on the materials prepared and provided by Sephardic Temple Tifereth Israel (STTI) in Westwood, California, as well as materials prepared by the Maimon Family in Seattle, Washington. My good friend, Linda Sendowski, has some wonderful recipes for Rosh Hashana foods, specifically these symbolic foods on her blog The Boreka Diary which I share with you. Also, the Rosh Hashana table of the delightful Stella Hanan Cohen was recently featured in the South African Jewish Review (Pages 14-16.) Check these out…and consider including some of these ideas and blessings at your Rosh Hashanah table this year. For our Seder, we prepare a plate on the table that holds some of each symbolic food, and a prepared page for all our guests, including the blessings we will recite for the evening so all can participate. We include the Hebrew and English, and some years, the Ladino. Adapt as is comfortable for your household. We start with the Kiddush, the Shehecheyanu, Birkat Yeladim (Blessing of the Children), Washing the Hands, and the Hamotzi. Yehi Ratzon May it be your will, Lord our God and God of our Fathers, to renew upon us a good and sweet year, from the beginning of the year until the end of the year. Baruch Ata Adonai Elohenu Melech Haolam Bore Peri Haetz. Yehi Ratzon May it be your will, Lord our God and God of our Fathers, that our enemies be cut off, as well as those who desire to do us harm. Yehi Ratzon May it be your will, Lord our God and God of our Fathers, that our enemies disappear, as well as those who desire to do us harm. Yehi Ratzon May it be your will, Lord our God and God of our Fathers, that our enemies be consumed as well as those who desire to harm us. Yehi Ratzon May it be your will, Lord our God and God of our Fathers, that you should tear up any evil decrees against us and let our merits be read before you. Yehi Ratzon May it be your will, Lord our God and God of our Fathers, that our merits may multiply as the fish in the sea. Others have commented that as fish is a symbol of abundance and fertility, we ask God to Bless us with both. Yehi Ratzon May it be your will, Lord our God and God of our Fathers, that our merits increase and that you purify us. Yehi Ratzon May it be your will, Lord our God and God of our Fathers, that our merits increase as the seeds of the pomegranate. Yehi Ratzon May it be your will, Lord our God and God of our Fathers, that we may be in the forefront as the head, and not the background, as the tail. The festival meal then follows. Mushrooms: May our abundance “mushroom” in the years ahead…. Have fun with this and make it meaningful to your family! Finally, I am attaching a link to a YouTube series of “The Selichot of Ezra Bessaroth”, in Seattle, Washington. It is a ten-part series of the Selichot service in the tradition of the Jews of Rhodes, led by Hazzan Isaac Azose, with many in the Congregation participating. The melodies are familiar to those of us who grew up in Rhodesli Sephardic Synagogues. There is something comforting and reaffirming in melodies, memories and flavors of our youth. I hope you will take a few minutes to listen and enjoy. Please share with us any of your own family traditions….we would love to post them. Sharing keeps traditions alive and evolving for each new generation! From our home to yours, Anyada buena i dulse ke tengas….a good and sweet New Year to all; Tizku Leshanim Rabot…May we all merit many years;! 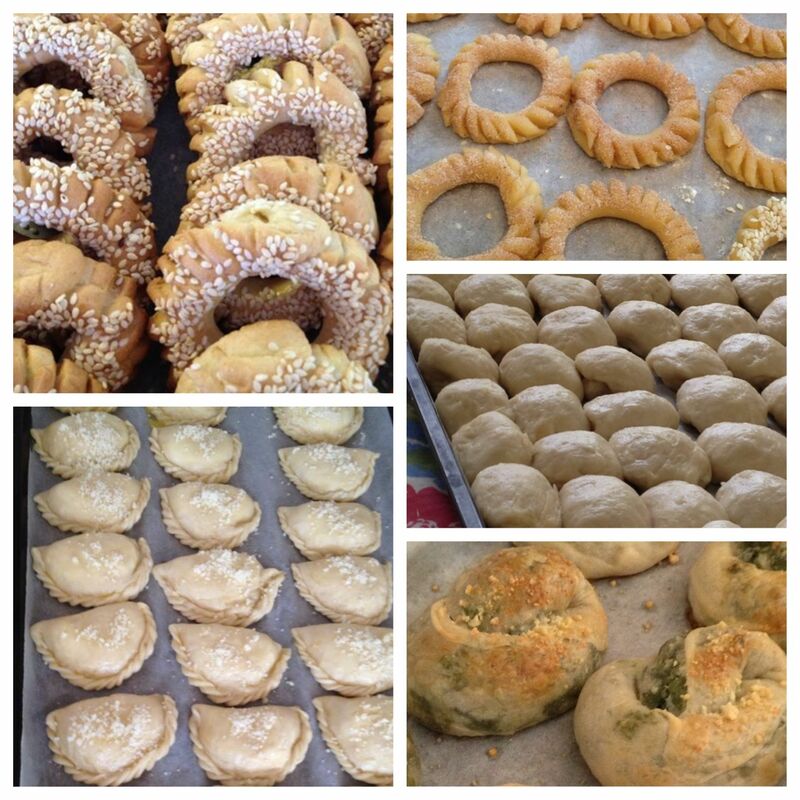 My mom is baking and preparing for Rosh Hashana…..Boyos, burekas, biscochos, pan di casa, reshas….all our family favorites. Posting some tried and true recipes in hope that you might give them a try. Please share your menus and favorite family memories with us. Together – we’ll keep our traditions alive! Wishing all an ‘anyada buena i dulce”. Tizku L’eshanim Rabot – may we all merit many years. The High Holidays are upon us! As we prepare to greet each other with wishes of ‘Anyada Buena’ (A good year) and ‘Tizku Leshanim Rabot’ ( may you be written for many, many years)….we prepare, too, for family gatherings and the special foods that we love to share. My mom has begun baking boyos, burekas, reshas, biscochos as well as some special sweet treats for a sweet year. I am posting past posts of some of these recipes. In addition, I am including a post about a traditional Rosh Hashana Seder. Some families call these the ‘Ratzones’, from the phrase ‘Yehi Ratzone’, (may it be your will…) referring to the opening words of the blessings, referencing the traditional foods that are eaten. It is a lovely, traditional Sephardic custom that has gained popularity in recent years even among non-Sephardim. I hope you will explore it. Perhaps add it to your family repertoire. Tweak it – add new elements – make it your own! I invite you to add your holiday memories as comments. Wishing you all an ‘Anyada Buena!’ A good year. Tizku Leshanim Rabot – may we all be written in the Book of Life and granted many, many years. One of the rich and unique traditions of our Sephardic families is a Rosh Hashanah Seder. It is a short service we conduct around our tables with the Rosh Hashanah evening meal, with some families doing it on both nights. Including the traditional blessings done at the holiday meal table (Kiddush, Washing of the Hands, HaMotzi), blessings are also said over symbolic foods, expressing our hopes and wishes for the year ahead. Most of the foods used are those whose names in Hebrew sound similar to one of the wishes expressed, so there is some fun associated with this! Although primarily a Sephardic tradition, many others have begun adding the Seder to their Rosh Hashanah celebrations. My father remembers the “ratzones” from his childhood in Seattle…we began sharing the tradition with our children and friends within the past decade. Rabbi Yitz Greenberg suggests that each family add some blessings of our own, adding to our family traditions, adding puns we create around foods we include, which we have done from time to time. 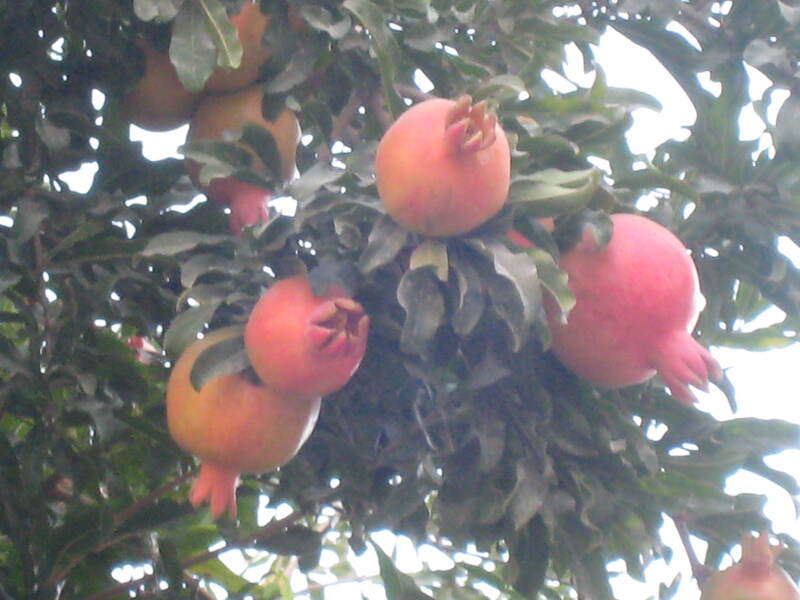 One of our Rebbetzins, Penina Schochet, suggested that we select a new fruit each year, having our young children be part of the process, and say a “shehecheyanu” over the addition of the new fruit, as a way to further grace our Rosh Hashanah table and include our children in selecting and trying something new. Finally, my good friend, Linda Sendowski (The Boreka Diary) has some wonderful recipes for Rosh Hashana foods, specifically these symbolic foods, on her blog, which I share with you. Check it out…and consider including some of these ideas and blessings at your Rosh Hashanah table this year. Following that, we recite a few blessings with intended good for the New Year, over some symbolic foods. The foods we use are usually plentiful during this season. Their Hebrew names, shades or colors remind us of our hopes and dreams for the year ahead. It is noted that “foods provide us an occasion to wish away our fears and verbalize our deepest hopes, as well as a chance to pun on their names in a number of local tongues”. (Source: Noam Zion in his paper Seder Rosh Hashanah). From my parents, Jack and Kaye Israel, my husband Robert, and our sons, Jason and David….Tizku Leshanim Rabot…May we all merit many years; Anyada Buena….a good, and meaningful New Year to you all!